My two batteries are Optima 12-volt, 75 Ah, deep-cycle, and zero-maintenance! The Optima batteries may be purchased through Amazon. A reader asked . . .
. . . for the size of the wire leading from the charge controller in the Perfect Tow Vehicle to the Anderson plug at the bumper and then leading to the Best Little Trailer. I do not know the gauge of the wire. I measured it and found that it is 1/2 inch wide. All my life it’s seems like I’ve been a day late and a dollar short. So when it comes to solar, I’m want BIG. A BIG 200 watt panel and a BIG set of batteries sitting on a BIG tow vehicle. (hmmm… and a tiny house . .. oh well). Hey Sue do you run your A/C unit or coffey maker using solar? if so hhow do you do it? I have been told that 90watts is plenty to re charge your battery and 130 watts is way plenty, why do you use a 200 watt? I am looking to go solar but know nothing about it. Hi Dan, I’ll try to answer your question for Sue as I advised her on the solar system. There are a lot of variables to consider when picking components for your system. First is your style of RVing; do you plan on boondocking or staying in parks with an electrical hookup available. Or some combination. Next you need to look at your usage. Big loads such as a toaster, coffee pot or microwave will require a bigger battery and bigger solar panel to re-charge the battery. And if you boondock what about 3 rainy days in a row. Of course you could always pack up and run to a park with electrical hookup. 1. Energy usage is watt-hours or simply the watt rating of the unit times the hours of usage. A 120 volt TV that draws 1 amp (look on the label) is 120 watts and if you watch it for 3 hours then you have used 360 watt-hours. 2. Battery capacity is usually stated in amp-hours. To convert to watt-hours you multiply by the battery voltage, usually 13 is a good number. So a 75 amp-hour battery has 975 watt-hours. But now the hook, The battery rating is the total capacity until it is dead, 100% discharge . For long battery life you should try to average 25% discharge per day, so that is only 244 watt-hours. Many people will discharge to 50% but now with a couple rainy days you are hurting your battery. 3. Solar panel … 200 watts on a bright sunny Arizona day in June at noon; every other situation is downhill. A more real number on a sunny day might be 100 watts for 8 hours or 800 watt-hours. And on a cloudy day maybe 50 watts or less. In the winter your charging day might be only 5 hours. The panel won’t charge if the sun is too low in the sky. A rainy day could be zero. 4. The RVsue system is 200 watt panel feeding 150 amp-hour battery. A good balance would be 1 solar watt for 1 battery amp-hour. But as you can see there are a lot of “if’s”. Thank you Mick that great info! Funny, I was thinking 2-3 200 watt panels and two 4D or 8D batteries would be about right for boon docking. Solar panels are cheap now. And as Mike said, you really don’t ever want to deeply discharge them. If you keep the charged, they can last for many years. I live very simply. Not because I have to. It’s the way I am. A 200-watt panel and two AGM batteries in the PTV along with the house battery are plenty to supply my needs. My refrigerator, stove, and heater all run on propane. Sue, we read Bob’s link but had a question. We have been on the hunt for 2/O wire to run from the batteries to the back of the camper. Can’t find it anywhere. 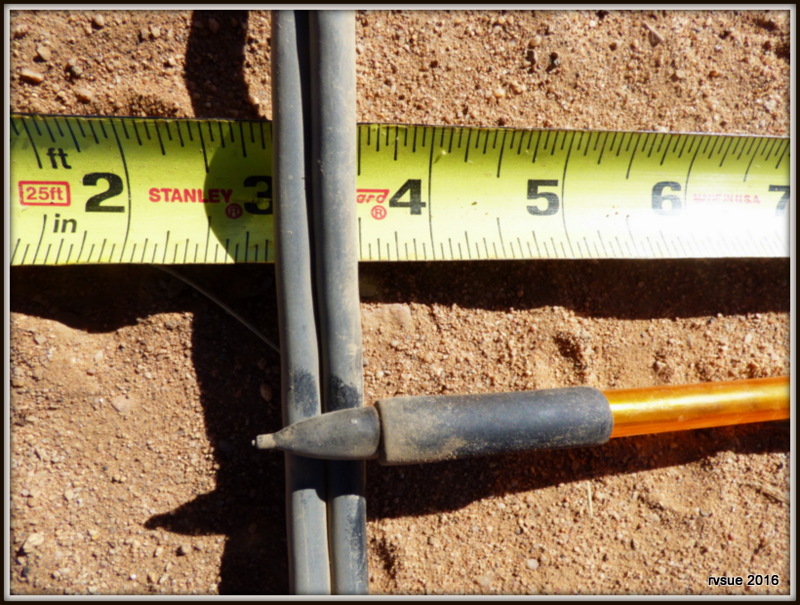 What wire did you run from your batteries to the Casita and where did you get it…maybe we don’t need that big of wire? I calculated the voltage drop using a calculator. Going 15 feet using #4 you lose 24%, using #2/0 you lose about half of that. I wouldn’t worry too much if you don’t need a lot of power, I roughed it in the Arizona desert for 3 months on foot. Coffee Pot, DVD Player, Lights, Laptop Computer, Cell Phone, and occasional power tool; all used and never ran out of power. All of my wire was the smallest size recommended. I had 1 Battery and 2 100 watt solar panels. There are many variables that go into the formula so one set of rules do not fit all systems. Most people are using #4 with ok results. The truth is, very few people even have a clue as to how much power they are actually losing do to their design. I think my wire is 8/0… maybe 6/0. I wish I could remember. I’m not astute enough to tell the size by looking at it. It was installed by Starlight Solar in Yuma. They do excellent work, BTW. As for the wire from the front of the BLT to the house battery in the back, I don’t know anything about that wire. It was installed by the Casita factory. We value your input, especially since you’ve been there. Think for now then we’ll go the 4 route…always can be changed and easier on the pocketbook 🙂 Now all Jerry will have to do is run it throw the garden hose attached under the Casita 🙂 Thanks Sue…! !